HIPS filament is specially made for 3D printing. HIPS (High Impact Polystyrene) lets you print soluble supports using a printer with two extruders. It is used with ABS and dissolves in D-limonene (lemon-based solvent). It takes a few hours to dissolve. Available in 1.75mm and 2.85mm. Want to know how to use HIPS for 3D printing? For 3D printers with 2 extruders, the first print head takes ABS and the second HIPS. ABS lets you print the prototype while HIPS prints the support or holding structures for complex or cantilevered parts. Once printing is complete, you just have to immerse the prototype in D-Limonene solution to get rid of the parts printed with HIPS. Need advice before buying? Our experts are at your disposal to offer guidance so you get the most from printing this material. The best prices are at Makershop3D. 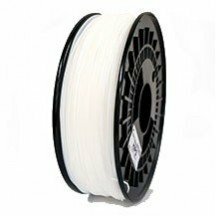 Soluble Green 3D HIPS 1.75mm filament is a filament that dissolves in D-Limonene. It is useful for your creations with overhangs (supports) on printers with 2 heads. Green HIPS 1.75mm 1kg spool. Soluble Red 3D HIPS 1.75mm filament is a filament that dissolves in D-Limonene. It is useful for your creations with overhangs (supports) on printers with 2 heads. Red HIPS 1.75mm 1kg spool. HIPS is an excellent support material for ABS, easy to print and dissolves in D-Limonene. Suitable for large prints or which require a lot of details for making models and prototypes. Comes in a 750g spool.